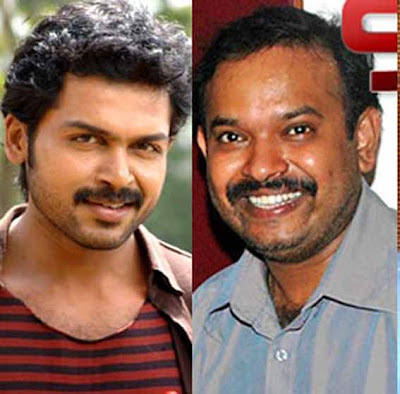 'Biriyani': Director Venkat Prabhu - Karthi's next! Director Shankar is reportedly preparing for his next film which will be with Chiyaan Vikram. There was much speculation about who the heroine would be with Bollywood names being tossed around. Finally, it seems that Samantha has become the chosen one. The actor is currently on a roll with the tri –lingual Neethane Enn Ponvasantham (NEP) directed by Gautham Menon and Kadal with Mani Ratnam already in her kitty. But the buzz is that she may not be the solo heroine of Shankar's film and another Bollywood beauty maybe roped in. PC Sreeram is handling the camera while AR Rahman is doing the music. After the stupendous success of 'Mankatha' Venkat Prabhu will be teaming up with Karthi Sivakumar for 'Biriyani'! The film will feature Karthi in the lead role along with a host of stars including Premgi Amaren and several others. While 'Chennai 28' dealt about cricket, 'Saroja' about the kidnap of a school tot and 'Mankatha' on heist of cricket betting money, this film will deal with a whole new issue, an unexplored plot line. 'Biriyani' will go on floors come August and will bear the tagline, 'A Venkat Prabhu Diet'. With music by Yuvan Shankar Raja the film will have Venkat Prabhu's usual technical team including Sakthi Saravanan for cinematography, Stunt Silva and editing by Praveen KL. A special screening of Billa 2 was arranged for director Shankar recently. Distributed by Aascar Films, Billa 2 is close to completion and will be ready to be released in the month of September. The special screening also was attended by director Chakri Toleti and Aascar Ravichandran. A clearly impressed Shankar was seen congratulating Chakri for his feat after the movie's screening. He also extolled Ravichandran for making the right choice, according to sources present at the event. With Ajith, Parvathy Omanakuttan and Bruna Abdullah in the lead, Billa 2′s audio release is expected soon.